On a spring woodland walk in our region you may spy, among other early flowering plants, a true spring ephemeral with a string of whimsical little creamy white flowers suspended upside down on short stalks from a nodding stem. The common name, Dutchman’s breeches, comes from the appearance of these flowers, which are reminiscent of pantaloons. They will also have a golden colored tip, like a band around their imaginary waistlines. The cluster of flowers will be hanging above a clump of delicate, finely lobed, blue-green foliage. Come back when the tree canopy has leafed out and the whole above-ground plant will have disappeared, after gathering needed sunlight, converting it into nutrients, and setting its seeds. The above-ground work accomplished for the year, it will await the signal of next year’s warming sunlight before again growing stems, leaves, and flowers for its brief annual sojourn above the surface. Dicentra cucullaria grows 6 to 12 inches tall from a cluster of pink to white grain-like tubers, closely packed like scales of a bulb, which soak up and store nutrients for its rapid spring growth. The much dissected leaves are basal, soft, and form mounds. The ¾ inch flowers consist of two pairs of petals. The outer pair is long spurred and white. The smaller beaked inner pair is cream to yellow and forms a small crest shape around the pistil and stamens. Dicentra cucullaria is dependent on bees for pollination, but unless they are large bees with a long proboscis able to pry open the petals, they receive no reward of nectar for their services. Bees find these plants by scent though they are essentially lacking in scent to us. 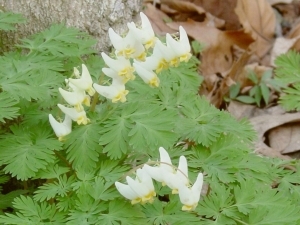 Dicentra cucullaria is a member of the fumitory family (Fumariaceae). 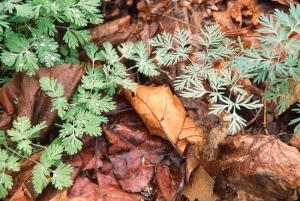 Previously the fumitory family was recognized as a subfamily of the poppy family (Papaveraceae). The name Dicentra is Greek for two spurred; di meaning two and kentron meaning spur. Cucullaria is from the Latin cuculus which means hood and refers to the smaller petals which form a cap over the inner parts of the flower. Another common name for D. cucullaria is blue staggers. Alkaloids contained in the plant have been known to kill cattle that ingest it. Symptoms become evident 48 hours after ingestion and include trembling, staggering, and difficulty breathing. Despite (or perhaps because of) the alkaloids, the plant was used by European colonists in salves for skin diseases and also for urinary tract infections. 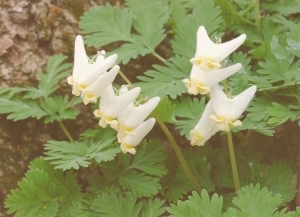 Dicentra cucullaria is found from southeast Canada to the mountains of Georgia and west to North Dakota and Oklahoma. It is also disjunct in Idaho, Oregon, and Washington. We find this spring ephemeral throughout our region primarily in rich deciduous forests and borders. These habitats not only provide sunlight in early spring but offer a neutral soil which this species prefers. They make a beautiful contribution to the woodland garden when mixed with ferns and other plants which will fill the space they vacate early in the growing season. Just don’t plant them near conifers unless you plan to side dress them regularly with lime. Propagation is fairly difficult (but rewarding) from seed as the seeds will not tolerate any drying and require a warm then cold then warm stratification. They are normally dispersed by ants, which carry the seeds to their nests. The ant nests provide good conditions for stratification and germination the following spring. At the same time, the ants reap the benefit of the nutrients in the elaisomes (an oil-rich fleshy structure) attached to the seeds. In the garden, the easiest way to duplicate this is to watch the flowers closely and sow the seeds as soon as you notice the fat pods starting to rupture and the seeds turning black. Vegetative propagation is fairly easy. Dig the bulblets in the summer when they are dormant and replant or pot them. Please, only propagate the bulbs from garden settings in order to protect the wild populations of Dutchman’s breeches and the habitat they depend upon. Plants can sometimes by obtained from local nurseries, but be sure to ask about their sources and whether they can certify the plants are nursery propagated.